A National Police Agency panel on Friday proposed several new rules to regulate elderly drivers, including limiting them to vehicles with automatic braking systems to increase public safety. The panel was tasked with finding ways to mitigate the risks associated with dementia, poor vision and deteriorating physical strength associated with seniors. 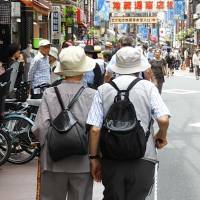 Deadly traffic accidents caused by people 75 or older are on the rise, though fatal accidents overall are on the decline. The panel’s proposal calls on the government to create a new driver’s license that limits seniors to vehicles with advanced safety systems that can automatically brake or mitigate unintended accelerations. Seniors could also be restricted to driving at certain times or in certain areas. The panel also recommended continuing ongoing campaigns urging the elderly to voluntarily give up driving. Similar practices have been put in place in other countries, including the United States and Germany, and the Japanese police are preparing to study their viability in Japan. The panel also suggested having elderly people seek medical diagnoses more quickly if cognitive function tests taken during license renewal reveal potential problems. Since vision problems are believed to worsen with age and lead to accidents, the panel said the NPA should study appropriate methods for visual examinations. In March, a revised road traffic law took force that beefs up cognitive checks and instructional courses for people 75 or older. If a mandatory cognitive function test, conducted every three years as part of the license renewal process, indicates signs of dementia, elderly drivers are obliged to see a doctor. If they are diagnosed with dementia, driver’s licenses can be revoked or suspended. This is expected to increase the number of license nullifications and other penalties to 15,000 per year, with 540,000 people taking the revised courses each year, according to the panel. To deal with the expected burden, the panel called for securing enough doctors for dementia screenings and instructional courses at police facilities. While license revocations could help prevent traffic accidents, they could also cause transportation access problems for the elderly. If the proposed limited licenses allow seniors to drive in certain areas or at certain times, depending on their health, they might be able to take care of small but essential tasks, such as going to the hospital or grocery store. The number of people aged 75 or older who are licensed to drive stood at about 5.13 million at end of 2016, compared with 2.58 million in late 2006.